February, 2008 Last year's theme was Nemo for K's second birthday. 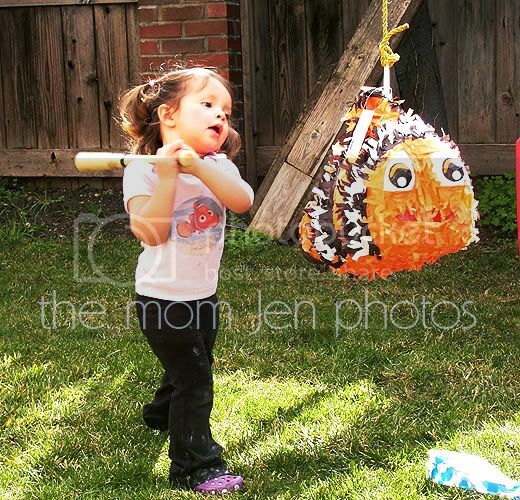 She was not afraid of beating Pinata Nemo with a bat with a mighty swing. Not when you know his tummy is stocked with Kit Kats and Peanut Butter Cups! She's gonna be a ball player for sure! Hey...where's Mr. Linky? Is he broken again? Now I'm going to bed...gnite! As I said from my blog...she really is adorable. I think Mr. Linky is either broken or he hasn't come up yet. I'm going to bed and will check back in the morning. ps. Hope your Mom is doing better! Very cute picture. She is adorable! Lord knows, I'd have beaten that pinata to death trying to get to them Kit Kats! Their my fave. Anybody get hurt with that Mighty swing? Aren't pinatas great. We had one 2 years ago and now every Amazon box looks like a pinata "waiting to happen" to my kids! They decorate them (less and less) and want more and more candy! LoL! What a sweet picture. :) We're in the beginning stages of planning Alex's second birthday. I'd smash him into tiny bits for peanut butter cups too!!!! Gonna try this... try to get my post shortly. She is so adorable! Those are fun! I was just watching a home video of when my little brother turned 6 and had one! I had a good laugh! adorable!! I want to come and eat the candy from the pinata! How FUN! I usually get my middle boy a pinata for his birthdays. Check out my ATWT pic! I love pinata pics. Look at the concentration. Poor Nemo. She looks ready to wake poor Nemo good. I love the determination. She's so sweet I could pinch her! thanks for hosting such a fun carnival! adorable- the concentration in her face! She get those curls cut off yet? Your daughter is just too dang cute! Ohhhh. how that makes me yearn for warm sunshine. Adorable. Alright - "K" ,foot spacing looks good. Now get the bat off your shoulder for better velocity and rotation. Now step into it, hard. NICE....Enjoy the fruits of your labors kiddo. She worked so hard to bust that open!! Don't get in her way. She means business! Oh yumm. I think I would have taken the bat from her for some kit kat's and peanut butter cups! Oh how I miss chocolate! Look at that face! I'd go after it, too if there were kit kats involved! I love the look and determination on her face! Gotta love a girl with a bat! Swing it, baby! Thanks for making for a fun Thursday. Love it! Thanks for A Thousand Words Thursday. I am feeling "blah" today and could not think of anything brilliant to post. After reading your blog you inspired me to look through my photos and find something I loved. Thanks! She is on a mission...poor Nemo! 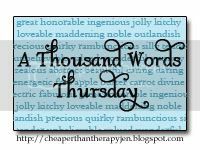 Thanks for giving us "A Thousand Word Thursday". love it!!! she is so cute, swinging that bat! This is an awesome picture! What photo editing program do you use? Did you say peanut butter cups? Yeah, I'd be beating that thing like crazy! Awwww- she's such a cutie! I love the cheeks! Oh dear! Nemo is caught and can't get away with the goodies!